Ah, back to the 30-day video game topics. Despite the obvious implication that this is only supposed to span the course of roughly a month, these posts have been taking me years to get through. Well, better get back to it. Right now, we’re only on day 13. The topic: a game I’ve played more than five times. There are a lot of games I could name right now that I’ve played far more times than is sane, but the one I’ve chosen to discuss is Donkey Kong Country 2. By now, many of you are probably more than familiar with the fact that I love this game. Even more of you are probably just familiar with this game due to your own experiences with it and don’t need any explanation for why it’s such a great game. So I’m not getting into that. The game was released in 1995, for crying out loud! That was 21 years ago! Wow, has it really been that long…? 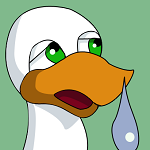 The Duck is still working through the 30 day video game posts, slowly, like an unusually fatigued squirrel, with strength left in its fingers only, creeping towards an acorn, thirty acorns. In winter. When they move more slowly. No, it’s reptiles that move more slowly when it’s cold. Never mind. And today’s topic, only topic 6, actually, which makes me further realize how pathetically slow I’ve been, is on the most annoying video game character, a rather difficult one for me. Some characters are indeed annoying, like Prince Tricky from “Star Fox Adventures”. But, is he annoying enough? Or Kiddy Kong from “Donkey Kong Country 3”, who is actually more creepy than annoying. Or Lanky from “DK64”, who is also creepy, in an annoying way. There are also bossy characters that tell you what to do, like various sidekicks in “Zelda”, or whenever Professor E. Gadd harasses me in “Luigi’s Mansion: Dark Moon”. Stop calling me, you creepy, old man that looks like a decrepit child! Mario. Yes, Mario. From the “Super Mario Bros.” games. Why? Two words. Slippery shoes. I hate Mario and his slippery shoes. Never have I played a game where a character has so little traction on their feet. You’d think the soles of his shoes are made of butter or wet soap or a slick sheet of ice. I have so many unhappy memories of playing the old “Mario” games on the Super Nintendo and having teeny, tiny platforms to land on, and I land on them just fine (after dying many times because I kept missing prior to the times I did indeed land on them), and then Mario slides right off. You know how annoying icy levels in video games are, when your character always slides to and fro, and you have trouble getting them to actually cooperate with you? Well, in a “Mario” game, it’s like every level is an ice level. Thanks to Mario. And his stupid, idiot moron shoes. I’m serious. It bothers me so much. I seem to have much less trouble in newer “Mario” games, but I still can never get over the amount of pain those old “Mario” games have caused me. If Mario wore some nice hiking shoes or even ran around barefoot, perhaps, the games would have been a different experience. But, no, Mario decides that it is a good idea, when embarking on a treacherous journey to save Peach again, to wear shoes that would get you killed walking in your own house, let alone mountains and forests and all manner of other locations that all like to involve bottomless pits and stick-like platforms placed here and there throughout bottomless pits. Does Mario think he’s funny? Does my pain amuse him? Is he that bent on bothering me that he’ll risk dying due to his slick shoes? It certainly seems that way. Few games are more frustrating than the old “Mario” games, and it is all thanks to Mario and his sadistic (and masochistic, as his own poor decisions harm him, as well) choice of footwear. And yet, Mario is so dang popular, which only makes things worse. It does! Really! There are constantly new “Mario” games. But, do we see new “Metroid” and “Zelda” and other such delightful things very often? No, we do not. Samus and Link have the common decency to wear proper shoes in their adventures, and yet Mario gets the spotlight. Mario gets all the games. Mario gets everything. And this simply isn’t fair. Not to gamers that are not infatuated with this particular plumber. Not to gamers that would like to see characters that give a darn about their fans (by wearing shoes with traction!) get more games. No, this man named Mario has gotten out of control. Someone ought to rein him in. He is a fiend. A fiend, I tell you. That has the nerve to wear slick shoes, and yet he still stays popular in the gaming world somehow, probably only because he has some unsavory connections, which only funds his ‘shroom addiction. Mario, you annoy me. You really do. Watching you die a dozen times in “Super Mario World”, due to your bad decisions, not mine, annoys me. If I die in a game, I want it to be because of my own mistakes, not those of my character. Perhaps if you wore proper shoes, maybe Peach wouldn’t be kidnapped so often. You probably run at Bowser whilst he’s in the middle of taking the princess, yet miss and slip right on past, while that dastardly turtle gets away with his crimes once again. You should be ashamed of yourself, Mario. You know what, I bet you want Peach kidnapped, so you can have more games. And more coins, that you spend on your unhealthy addiction to fungi. And so, my readers, do you not see what a most bothersome, most obnoxious, most annoying person our Mario is? And it all stems from his slick shoes. That he bought. With the coins he didn’t spend on ‘shrooms. Hours of my life have been wasted trying to get him to navigate precarious platforms, only to fail because of these shoes. But, I can’t blame the shoes. I blame the man wearing them. I blame you for my problems, Mario. I blame you.